It’s hard not to feel when watching INXS: Never Tear Us Apart that there’s a red raw, Aussie DNA running through the spine of this miniseries. Even if you were never a fan of the rock band that took on the world in the 1980s and 1990s you’d be hard-pressed not to know a few of their hits. Devil Inside, New Sensation, Original Sin, What You Need, and the title track -they are the soundtrack of a generation. I still remember where I was when I heard of the tragic death of singer Michael Hutchence, and I didn’t even consider myself a fan. It was a moment in time. How he came to that endpoint is the story behind INXS: Never Tear Us Apart. Part One of this two-part miniseries is full of optimism. It is a rags-to-riches story of a suburban band playing covers at a local pub in Perth when they really wanted to play their own, original compositions. Playing covers of 1960s soul they are blasted by a local publican for not performing current songs “from the radio.” When they lose their only residency they are told “You’ll be nothin’!” Yes, in truth it’s a rather cliche start, but Director Daina Reid gets away with it largely because of the strength of the 6 young actors portraying the band. In their hands we empathise with these rebellious, talented underdogs. The band makes a pact to never play another cover again -possibly a bit of dramatic license, but dammit we want to hear their music anyway. At their next gig in the outback the crowd is hostile until Michael Hutchence (Luke Arnold) lets rip. Even at this forgettable venue in the 80s Hutchence’s presence is evident. He has the moves, the pouts and attitude to arrest a crowd, and the girls just love him. He happily responds, both on and off stage. When the band decide to move to Sydney, the parents of the Farriss brothers take some convincing. Youngest band member Tim Farriss is only 17. But with Hutchence’s girlfriend Michele (Jane Harber) in tow, they head East in pursuit of good times and rock and roll. Eventually the band are introduced to manager C.M. Murphy (Damon Herriman) who renames them INXS (‘excess’ surely sums them up) and books relentless gigs up and down the coast as part of his master plan for international success. Australian success, he insists, is not enough. The gigs are punishing, the parties are reckless, and there is even a Countdown appearance (Grant Piro plays Molly Meldrum). It’s here that Hutchence meets a young Kylie Minogue (Samantha Jade). Meanwhile, Michele finds the isolation in Sydney a trial. But the band’s fortunes are rising. Andrew Farriss (Andy Ryan) writes energetic music, a mix of rock with a white R&B edge while Hutchence’s lyrics come from deep within but speak to their audience. Murphy meets with a music label in the US and insists on selling territories separately -an outrageous demand for is time. He also spies the newly-born MTV, and invests heavily in music videos. But there are darker touches at play, with flashbacks painting a troubled upbringing for Hutchence with his mother. There is also a documentary looking back from the height of their fame at a sell-out Wembley concert. Arnold is quite sensational as the dynamic, tortured Hutchence, revelling in the girls and fame, expressing inner doubts through his lyrics and creating a stage force. Damon Herriman drives the script’s external force, by constantly challenging the band. Of the remaining ‘lookalike’ band members played by Hugh Sheridan, Alex Williams, Ido Drent, Nick Masters, it is Andy Ryan as Andrew Farriss who enjoys the better subplot, showing how he crafted some of the band’s best songs. The spirit and camaraderie of these young men spills off the screen. Jane Harber brings a quiet stillness amid the frenetic, grunt. Samantha Jade makes an effective debut as the shy girl from Camberwell -Kylie- about to be changed forever by meeting the intellectual, rock animal. Watching this miniseries I was reminded of Paper Giants and Howzat -great Aussie yarns from recent history that have wide appeal and deserve to be celebrated. The script is co-written by Justin Monjo and Dave Warner -the latter was a former rock and roller himself. If there is any criticism, it is buried in the end titles, indicating that certain events and characters have been changed for dramatic effect. For instance, we pick up the band in Perth, when in reality they met in Sydney. No doubt purists will find other creative license. But do yourself a favour. INXS: Never Tear Us Apart is a ripper. This is a review of Part One. 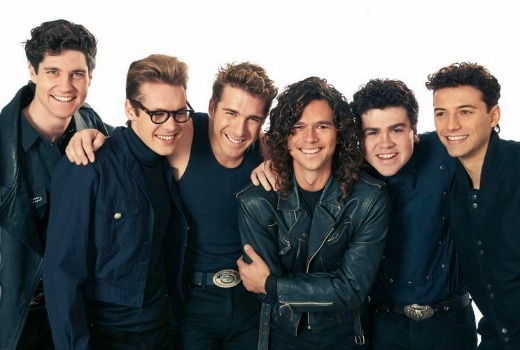 INXS: Never Tear Us Apart premieres 8:40pm Sunday February 9 and continues February 16 on Seven. I was puzzled by the scene with the babysitter. Not sure what the purpose of that scene was. Found part one slow starting but improved later in the show, but part two seems to be great and cant wait but the ending always seems to be the climax in all shows. Saw the preview during the week – stunning, brilliant, a must watch. Can’t wait for part 2.
geez Aussie_Austridge, you must have been living under a rock not to have heard of that song before? Done, thanks David. INXS on FTA and Rake on IView and Scha’pelle on encore. I love that you honestly review, it makes it easier. Will you be doing a review of Schapelle David? Be interested to hear your thoughts. I see what you did there, David “Molly” Knox. Very clever. I was surprised to see Kochie’s mini-doco about INXS on Sunrise which included part of a music video By My Side. I never thought that was an actual song and video. I heard a small part of it for years in the NRMA radio ads and I thought it had been written specifically for those ads.